How Trump’s New Executive Order Could Kill ObamacareThe new rules are designed to dramatically increase premiums in the Obamacare marketplaces — potentially inducing their collapse. President Trump Signed Order to Ban Transgender People From Joining MilitaryTrump follows through on his tweets, but leaves the status of openly transgender active service members up to Secretary of Defense James Mattis. 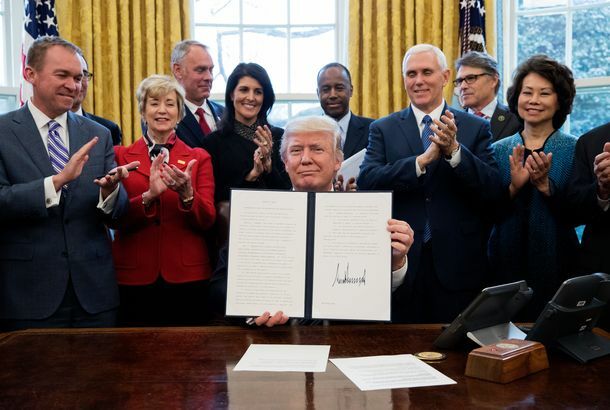 Trump Executive Order Aims to Relax Ban on Political Activity by ChurchesThe move is a symbolic victory for Christian conservatives, but it wouldn’t actually change the law. White House Readies Order Declaring Intention to Quit NAFTABannon’s back. Trump Writing Fake Executive Orders Because He Doesn’t Know How to Be PresidentThe 100th day is coming. Look busy! Trump Makes Labor-Law Violators Eligible for Federal Contracts AgainThe Fair Pay and Safe Workplaces rule bars serial labor-law violators from receiving federal money. Trump just overturned it. Jeff Sessions Calls for an End to Sanctuary CitiesBut he may be all talk, no action. Nazi-Affiliated Hungarian Group: Sebastian Gorka Swore a Loyalty Oath to UsGorka’s consistently shady ties to anti-Semitic and racist Hungarian political organizations continue to dog him. Make Things Illegal With This Trump Executive-Order GIF GeneratorIn a world where nothing is illegal, everything is illegal. White House Considers Deporting Legal Immigrants for Being PoorA draft executive order would allow the government to deport visa holders who receive public benefits. State Department Staffers Rushed Visas Through Before It Was Too LateAt a time when President Trump seems intent on irking as much of the world as possible, this is a somewhat heartening story. Trump Could Still Undermine the Obama LGBTQ Order He Just ReaffirmedSome good news for progressives — but beware a “religious liberty” order. Trump Signs ‘Nonsensical’ Rule to Curb RegulationsThe president’s latest executive order calls for the removal of two regulations for every new one adopted. Judge Blocks Part of Trump’s Ban on Citizens From 7 Muslim Nations and RefugeesThe hastily planned executive order, which has upended the lives of countless U.S. visa holders, has failed its first legal hurdle. Trump Signs More Vague Executive Orders, Wants Non-Secret Plan to Defeat ISISThe pen-happy, plan-lite president has signaled his desire to combat lobbying, be ready for cyberattacks, and have a strategy about ISIS. De Blasio Gears Up for Fight Over Trump’s ‘Sanctuary Cities’ Executive OrderHe said a legal challenge is likely. Trump’s Executive Orders Were Brought to You by BreitbartTrump’s flurry of orders were penned by the Bannon wing of the White House, with little consultation from cabinet agencies or Congress. And it shows. Trump Prepares to Radically Reduce American Funding of the United NationsTrump’s executive order would cut U.S. funding of international organizations by 40 percent, devastating U.N. peacekeeping and refugee aid efforts. Trump Revives the Keystone XL and Dakota Access Pipelines by Executive OrderBut it’s not clear that the White House’s support will be enough to get those oil pipelines built as planned. Trump Resents Obama for Acting Like He’s Still the PresidentThe president-elect sees Obama’s final executive actions as unfair attempts to undermine his agenda. Obama Plans to Shame Corporate America Into Paying Women EquallyLarge companies will now have to report how much they pay employees by race, gender, and ethnicity. The Modern Businesswoman Drinks Like Don DraperWhiskey on the rocks, please. Obama Will Ban Gay Job Discrimination by HimselfThe White House is drafting an executive order, since Congress won’t pass ENDA. Obama: Fewest Executive Orders in Over 100 YearsFewer than Reagan. Fewer than Bush. And the other Bush.